Britain's Adam Yates remains in second place at the Volta a Catalunya with two stages remaining. The general classification was unchanged after the 188.1km route from Puigcerda to Sant Cugat del Valles, Yates staying 14 seconds behind Colombian Miguel Angel Lopez. Germany's Maximilian Schachmann won the flat fifth stage for BORA-Hansgrohe. Saturday's penultimate stage is a 169.1km journey to the mountainous interior of Tarragona. Schachmann was the sole survivor of an early breakaway, finished 12 seconds clear of the pack for his second victory of the season. 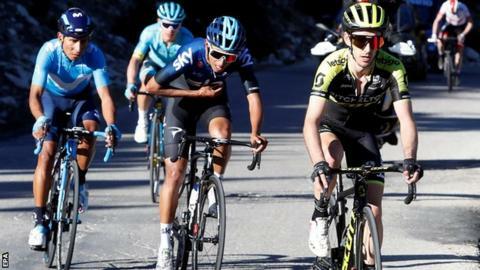 Egan Bernal of Sky walked in behind the main pack carrying his bicycle on his shoulder after suffering a mechanical problem but still retained his overall third place position as the incident occurred inside the final three kilometres. 4. Daryl Impey (SA/Mitchelton-Scott) "
5. Patrick Bevin (NZ/CCC Team) "